Since I wrote this post, Nosh and Quaff has sadly closed. It’s been replaced by , Jailbird, an upscale New York inspired steak and seafood restaurant and bar. 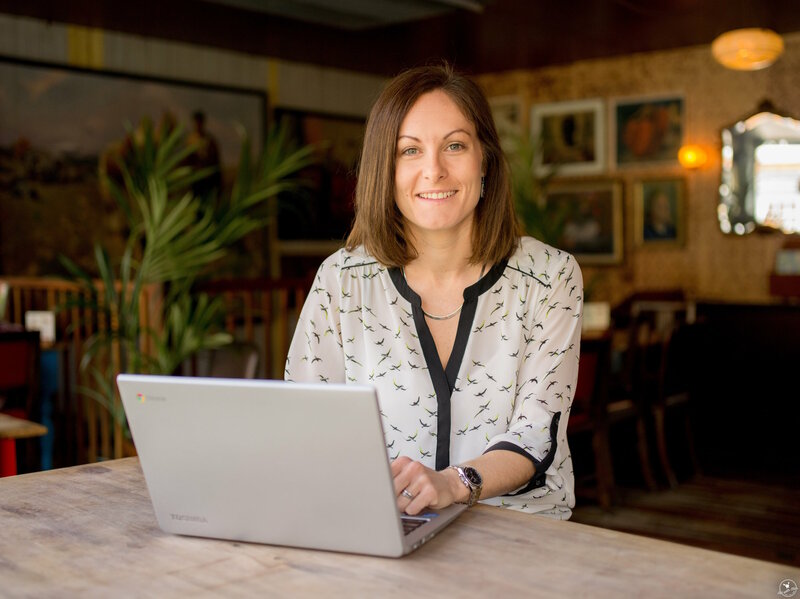 If you read any other foodie blogs relating to the Midlands, you’ll know that everyone’s eyes were pretty much on one place this last week – and it’s no surprise really. Nosh & Quaff is the latest addition to Lasan Group’s stable of restaurants, and if you’ve read any previous posts on this blog, you’ll see why it’s one that instantly appealed to the me and Mr Manning. Ribs, lobster, hotdogs, burgers, and the slogan “letsgetmessy”. Sound like us? Yeah, exactly! But it’s not all about throwing big portions of showstoppers at you – a lot of thought has gone into this place, and the experience of the team that brought Birmingham Lasan, Fiesta del Asado and Raja Monkey shines through. For starters, they’ve picked some prime real estate – right on Victoria Square looking out onto the city’s Town Hall and Council House. 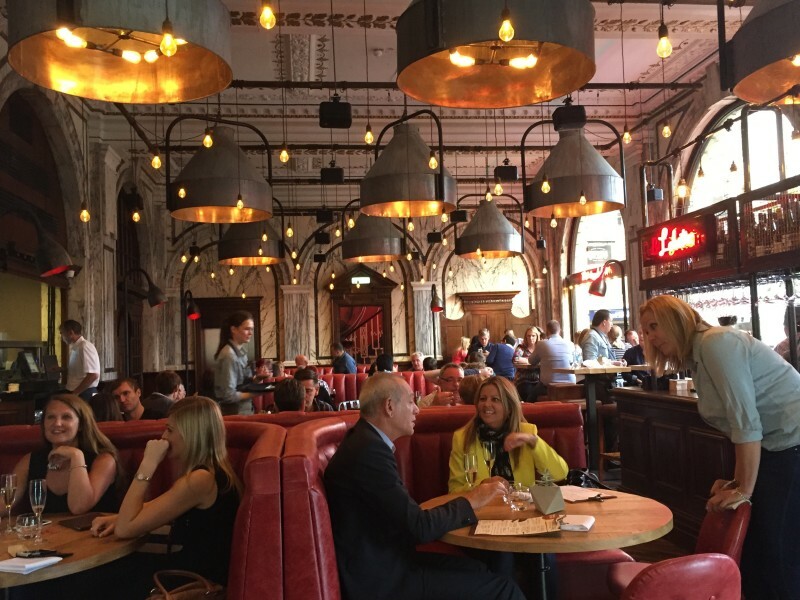 The interior is impressive, with the original listed building’s glory clear for all to see, yet sympathetically modernised to bring the fun, American-style convivial dining atmosphere complete with booths as well as high tables with stools. Upstairs was a pretty cool bar area, and down a spiral staircase in the depth of the building (apparently the former vault) are possibly the most ‘wow’ toilets I’ve ever seen. 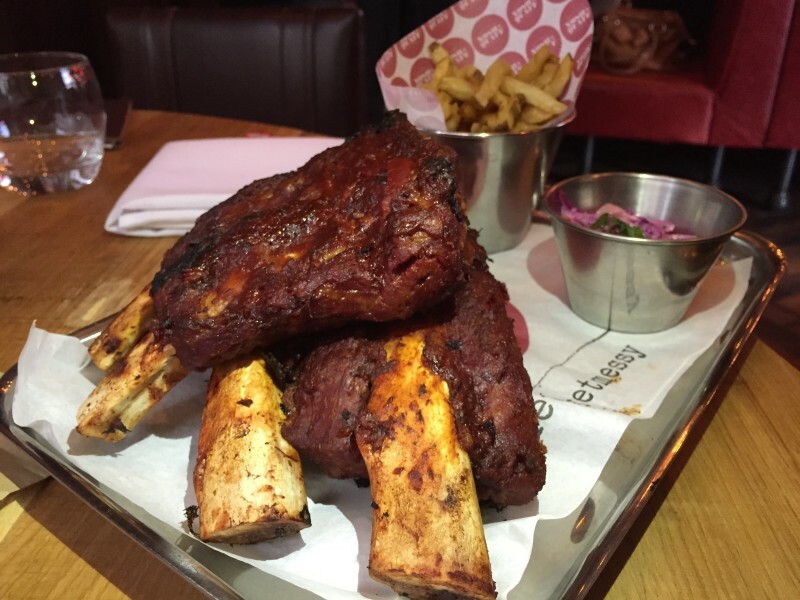 The menu is simple – beef ribs, pork ribs, burger, lobster, hot dog, wings. Everything you’d expect to see for a restaurant that’s following this theme. Mr M and I went for one beef ribs and one lobster, as well as an N&Q salad on the side. 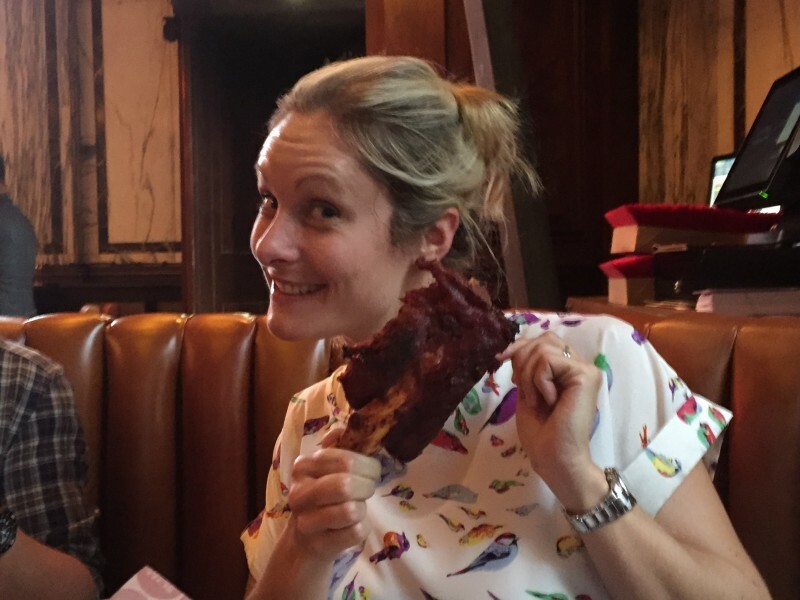 If you’ve looked back on previous posts you know how much we like our meat, which includes ribs. Mr M reckons they were the best beef ribs he’s ever had. Big, juicy, tender, hunks of meat that dropped off the bone with the gentlest of tugs with your teeth. The flavour was exactly how it should be – smoky with a concentrated tang of beefy flavour, and the sweetness of the molasses glaze. They came with crispy fries and a top-notch slaw. None of that mayonnaise-laden coleslaw you get in some places, but a refreshing, crunchy accompaniment. 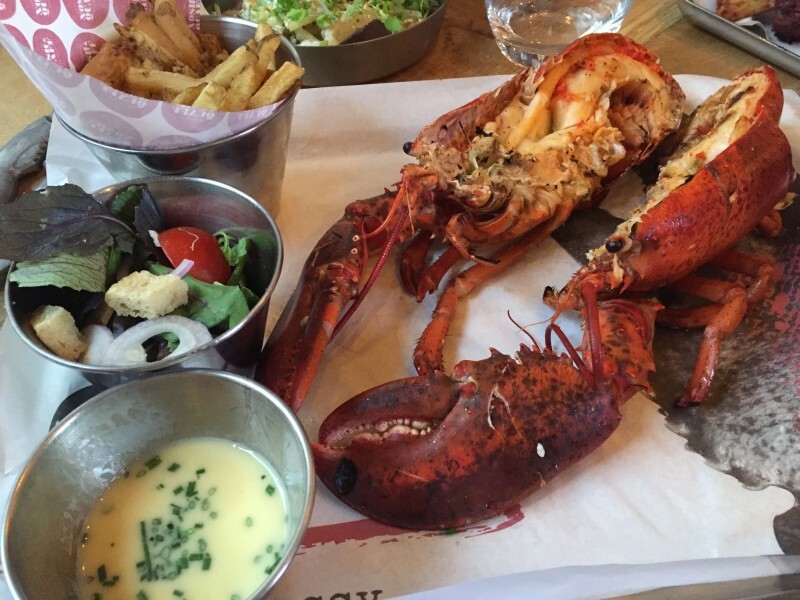 While Mr M sat silently devouring his half a cow, I tackled my lobster. There’s nothing quite like the joy of a whole lobster being put down in front of you, despite my slight lack of skills with the tools for the job. First up for me is always the easy meat from the body, which was tender, tasty, and simply cooked, just how I like it. The lemon butter sauce on the side was rich and calorie-laden, and wonderful when dripping off a lump of freshly-dunked lobster. I thought I had managed to extract most of the meat from the shell (thanks to a bit of claw-cracking from Mr M) but was put to shame when chef Aktar (Islam – one of the founders of Lasan) arrived at our table and expressed his horror at the amount of lobster meat I’d left behind. Who better to get a lesson in seafood dissection from than a guy who’s won Best Local Restaurant on Gordon Ramsay’s F Word as well as Great British Menu? Needless to say, I’ve now learned every crevice that I can extract even the tiniest bit of lobster meat from. Our salad posed a bit of a problem. How do you eat salad without cutlery? I’m slightly ashamed, but also a tiny bit proud, to admit that we fully embraced the “letsgetmessy” aspect of the night, and used our fingers until we realised that while Nosh and Quaff doesn’t offer cutlery, you can indeed have some if you ask for it. It’s safe to say, whether consumed by the fingerful or forkful, it’s a great addition to the menu. 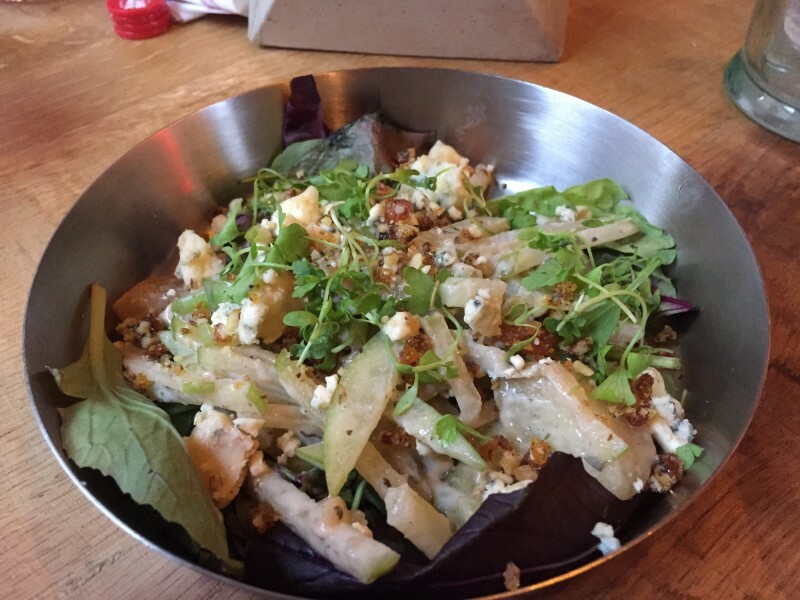 It’s a kind of variation on a Waldorf salad, complete with crispy apple and contrasting creamy lumps of cheese. A nice refreshing side to the rich lobster and ribs. We couldn’t resist pudding (when can we?). 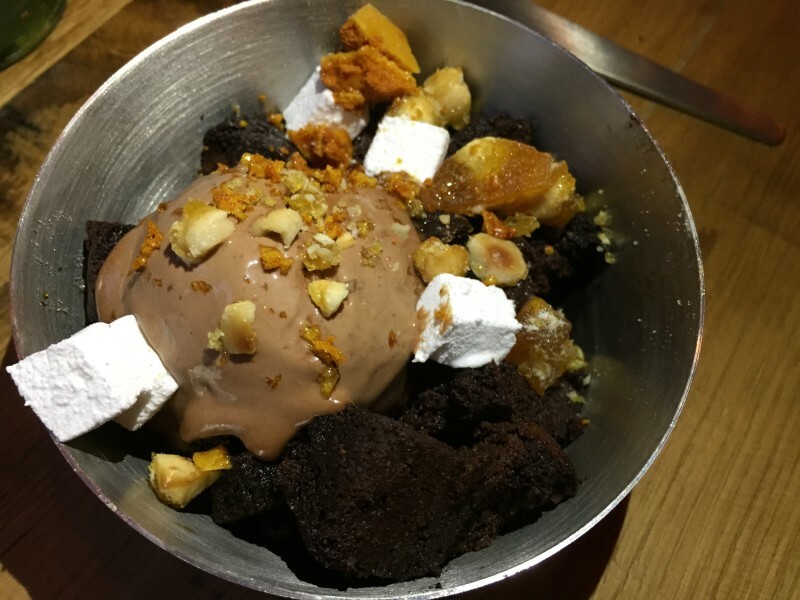 Chocaholic Jamie went for Rocky Road – rich chocolate brownie, nut brittle, marshmallow, ice cream and chocolate sauce. In his professional opinion, it was “amazing”. N&Q also offers ‘cheesecake’, which changes daily, so I went for the toffee apple. New York style cheesiness, with buttery toffee-y crumbley stuff on top, and apple sauce. Delicious, but it defeated me. The portions are huge, so bear this in mind. It’s not just the food that is trendy and tasty. The ‘Quaff’ has had as much effort put into it as the ‘Nosh’, with all sorts of beers on offer, as well as ciders and cocktails. We both tried ciders – mine an interesting one flavoured with blueberry and bourbon, but I’m assured the beers are pretty good too. The bar upstairs was a great place to relax after a meal (as full as we were), and a great finale to a wonderful evening. The guys at Lasan haven’t disappointed. They certainly seem to have the Midas touch when it comes to opening places that everyone loves, but having met Aktar and seen him and Lasan co-founder Jabbar Khan work the floor at Nosh & Quaff, I don’t think it’s a fluke. These guys don’t just know what makes a good eating experience, they’re also clearly passionate about delivering that. I’m pretty sure N&Q is going to be a huge hit in Birmingham. Great location, delicious food, good booze, all in a relaxed setting. What’s not to like? Unless you hate getting messy……. Definitely no qualms about getting messy here. Thanks to @Stegabyte of @BrumBrekkieClub for my memorable picture! 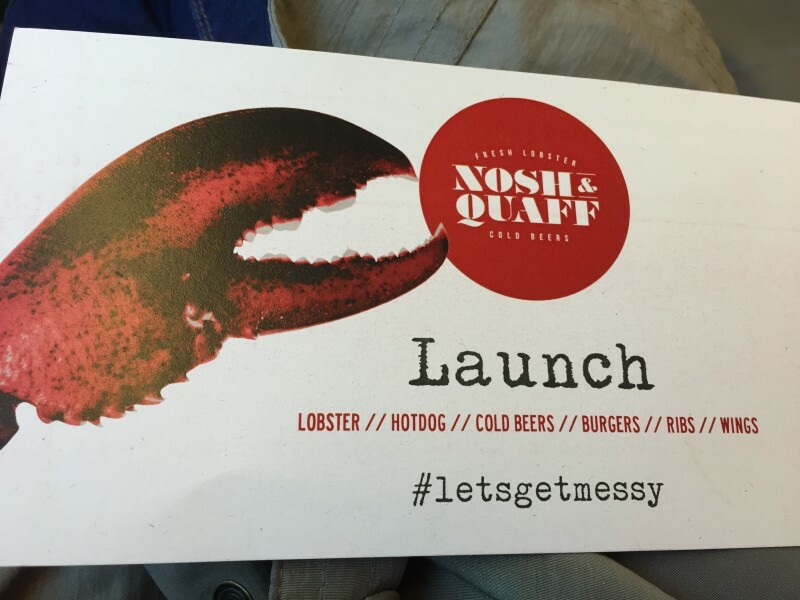 I was invited to the launch night of Nosh & Quaff. I wasn’t asked to write a review. All views in this are my own honest opinion.